Dark Places is Flynn’s sophomore effort, between her debut Sharp Objects and last year’s Gone Girl (click titles to read my reviews). I read the three out of chronological order, but it’s clear that Flynn’s writing became progressively stronger with each novel, and the characters and their lives more dark and twisted. For the record, Gone Girl is my favorite of the trio. Dark Places focuses on the tragic murders of the Day family of (fictional) Kinnakee, Kansas. In the wee hours of a cold mid-1980s January morning, seven-year-old Libby Day’s mother and two sisters were brutally murdered in their farmhouse. Libby escapes, and later her damning testimony pins the crime on her brother Ben, sending him to prison. Nearly twenty-five years later, Libby still is deeply scarred emotionally, wallowing in a self-loathing internal anguish, and realizes her memory (and testimony) of that night might not be as solid as she thought. Desperate for money, Libby takes up a local true-crime enthusiast group on its offer for cash in exchange for information about her family’s killings. She embarks on an investigative journey to discover what really happened the night of the murders, finding people from her past, bringing to light long-buried memories, and finding her life in danger once again. 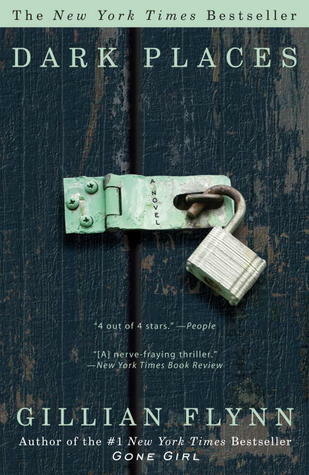 Dark Places ultimately boils down to a whodunit murder-mystery, and Flynn gave the readers enough new information at just the right pacing to make you question what you thought you had figured out. The ending was satisfying and believable for me. I had my suspicions on how the crime went down and who was guilty, but I wasn’t quite there, for which I’m glad. I was guessing all the way to the end! This book’s setting in the Kansas City area added an extra layer of enjoyment for me, too. I understand why she chose some of the bleakest, more rundown areas—Dark Places is also a story of stark, desperate poverty—I found the locations to be fitting, especially the West Bottoms for the Kill Club meetings. Dark Places was my fifth read of five books total for the 2013 KC Library Adult Winter Reading Program: While the City Sleeps, hosted by the Kansas City Public Library. Challenge completed! Read from February 28 to March 9, 2013. This entry was posted in books and tagged 2013 kc library challenge, drama, family, female adolescence, fiction, midwest, mystery, thriller by kristin @ my little heart melodies. Bookmark the permalink. I guess I have another author to track down to read. I’ve been meaning to pick up Gone Girl for awhile now but I might just have to start with this book. It sounds really well done, especially for someone that doesn’t particularly read crime thrillers or mysteries. Sounds exactly like the kind of book to ease into a new genre. I didn’t have much experience reading mystery/thrillers until I read Gone Girl in September last year, so I know what you mean! Flynn’s characters are often very messed up and do lots of unsavory things, but that sort of stuff in movies generally doesn’t upset or offend me so I enjoyed her books. Thanks for reading my blog! She really does! I think you’d be able to breeze through Sharp Objects and Dark Places pretty quickly, when you have a chance for them.